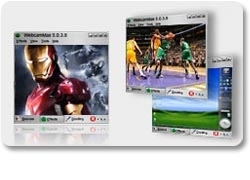 You might be waiting or looking for more functionality all on one package that helps you to add videos, picture, and effects to Webcam and many more that adds entertainment value, what you been expecting to do all in one package. Customize effects properties: change the effect's color, position, size, speed and etc. 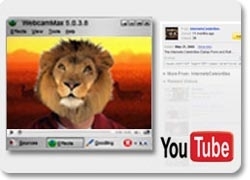 Attract the people by broadcasting with added effects and your unique video on blog or YouTube. Snap your webcam, a movie or your screen to make fantastic photos and post on your Blog. Save pictures in JPG, BMP, GIF or PNG format according to your requirement. 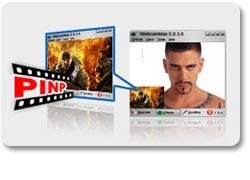 Select Webcam, Screen, Movie, Picture or Color to be the PinP Source. Using the fantastic Picture in Picture feature you can broadcast different sources at the same time. Customize your PinP: you can adjust the size and position of the PinP as you want and set the PinP quantity according to your requirement. 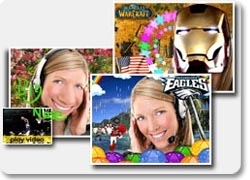 By creating designs directly on your video, you can make your video chat funnier and cooler.